Through-the-string grand voicing tool for fine voicing of individual hammers. 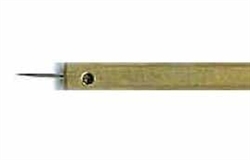 This slender 9” brass tool allows easy access to hammers — without pulling out the action! Single needle is held by set screw, and is replaceable. Includes hex wrench.